I am relaxed about today’s events because I am always in touch with the Infinite. God’s good works for all are already on the table. Solutions are already available and being implemented. The tide is already turning for good and taking all of us with it. My day is suffused with harmony and purity. My Higher Power is providing good for all of us everywhere today. There is no personal disrupting influence that can spread itself all over. A sense of divine peace is infusing the heart of everyone and placing them where they need to be today. They are provided with everything they need, including a peaceful place to live. The peace that is in everyone’s heart is providing peaceful negotiations for everyone in any conflict. The peace that is in everyone’s heart is taking care of the needy. The peace that is in everyone’s heart is settling once and for all that we are all equal and are recognized and provided for under the Law of Equality. 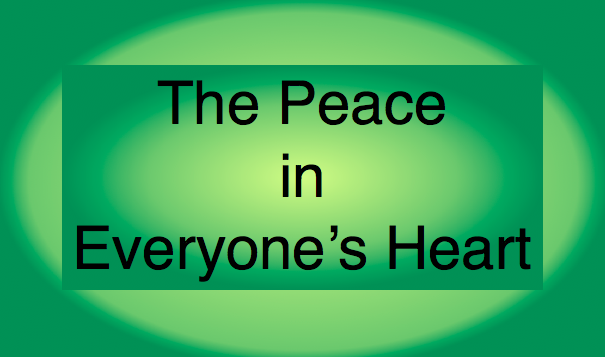 The peace that is in everyone’s heart is discerning the best solutions and implementing them. The peace that is in everyone’s heart is agreeing on every detail. There is a swift and harmonious solution in every case. We are all so pleased and happy and satisfied.